After a wonderful breakfast at the City Hostel in Berlin we had toward Linum. At the train station we gave our farewell to Manuel, who went bird racing. We had a lovely train journey to Linum. After that we arrived at the Linum Storchenzentrum of NABU. What a wonderful place! We began with a tour through the small village of Linum to watch the breeding storks, which are the villages pride. The tour was led by Lina and Joy, two gap year volunteers at the NABU Storchenzentrum. It was really inspiring to meet the young volunteers (17 and 18) and to see how dedicated and passionate they are. On the way back we walked through the Stork center garden. And there we experienced the barefoot trail. The barefoot trail was designed and built by a gap year NABU volunteer last year. 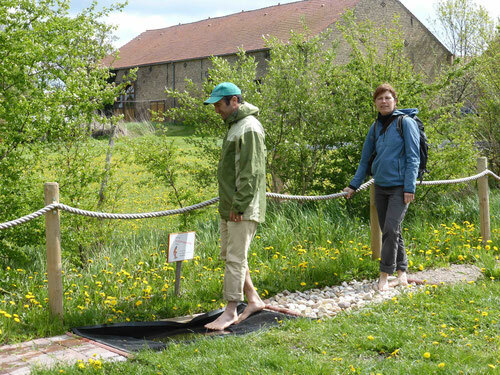 Both German and Israeli participants got very exited by the barefoot trail, some of the Israelis already have plans to build similar trails in Israel. Later we split into several groups, one group went birding, one group started working in the center’s garden and the important group started cooking for shabat. When the time was right and the food was ready, we all gathered around the shabat’s table, sang songs together. Amir made a beautiful and touching Kidush. The evening we faded away talking at the fire place.